Communities Alliance Against Displacement (CAAD) held its first general meeting on February 23, 2017, with 23 community representatives in attendance. 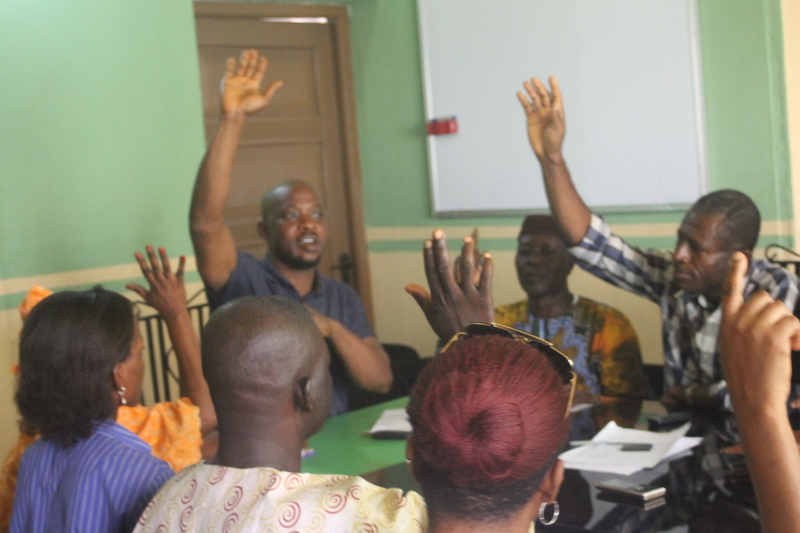 The meeting drew participation from displaced communities, including those settlements in Lagos threatened with forced evictions such as Mowo-Phase2, Ajeromi (Badia-East), Ebute-Metta (West), Otodo-gbame, Atikporome, Araromi-Ale, Otto-Ilogbo, Adekunle Makoko and Toluwani communities. The office of the General Secretary was also created to function as liaison between SPACES FOR CHANGE and CAAD. This officer will document, offer guidance on specific issues during deliberations of the general meeting (where necessary), and offer legal advisory services. S4C’s Aizighode Obinyan was appointed by members to undertake the role. CAAD’s newly-elected President, Pastor Aworetan Olatunde stated that he was humbled by the trust reposed on him to lead the group. He sought requested the cooperation of all communities to carry out the association’s objectives. His first priority is to personally visit all the member-communities for proper introduction and to get a better understanding of challenges they are facing. He harped on teamspirit, solidarity-building and bolstering exchange of ideas under CAAD.